as part of Angkor Archaeological Park, listed as WHS in 1992. Location: Bayon Temple is in the center of the walled city of Angkor Thom. Bayon is a UNESCO World Heritage Site [WHS], as part of Angkor Archaeological Park, which was listed in 1992. Angkor Archaeological Park contains the magnificent remains of the different capitals of the Khmer Empire, from the 9th to the 15th century. They include the famous Temple of Angkor Wat , and also monuments like Bayon, Baphoun, Elephant Terrace, Ta Prohm, Preah Khan, and Banteay Srei. The Bayon is Jayaverman VII’s own temple-mountain. Bayon is in the exact geographical center of Angkor Thom, the 9 km2 large capital city of the Khmer empire. 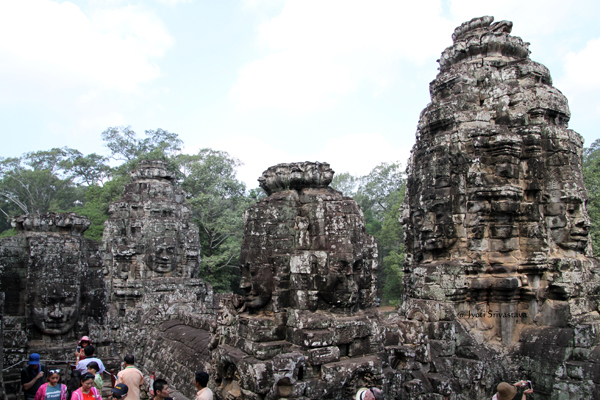 Four roads from the four entrance Gates of Angkor Thom lead directly to Bayon temple. Unlike most Khmer temples, the Bayon is not surrounded by a moat. Instead the moat and walls of Angkor Thom served as the temple’s line of defense. 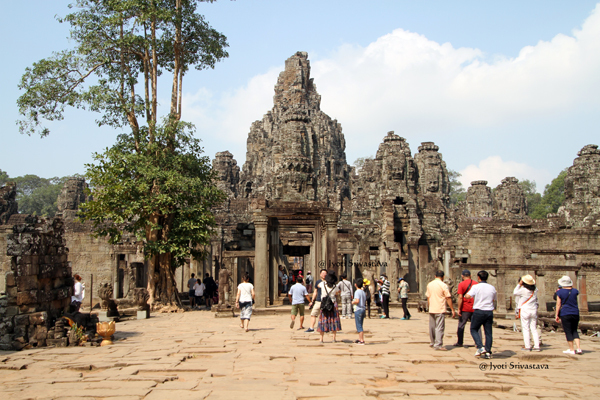 which was also responsible for the Gates of Angkor Thom, and the temples of Preah Khan, Ta Prohm, and Banteay Kdei. BAYON – UNESCO World Heritage Site, as part of Angkor Archaeological Park. Face Towers of Bayon / Siem Reap, Cambodia. 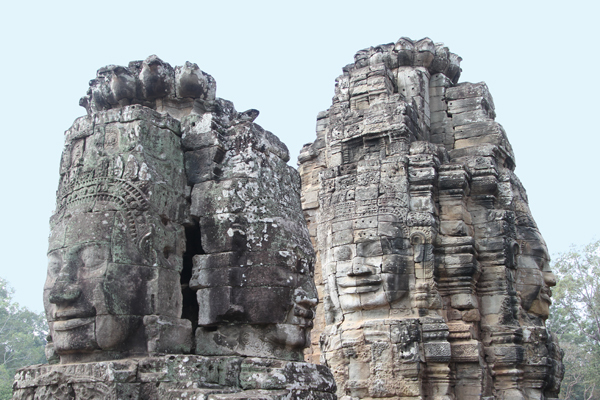 The Bayon’s most distinctive feature is the multitude of serene and smiling stone faces on the many towers. Each tower has four gigantic faces, in four directions. There are more than 200 faces. Notice the imilarity of statue of Jayavarman VII and the Bayon face-towers / Siem Reap, Cambodia. 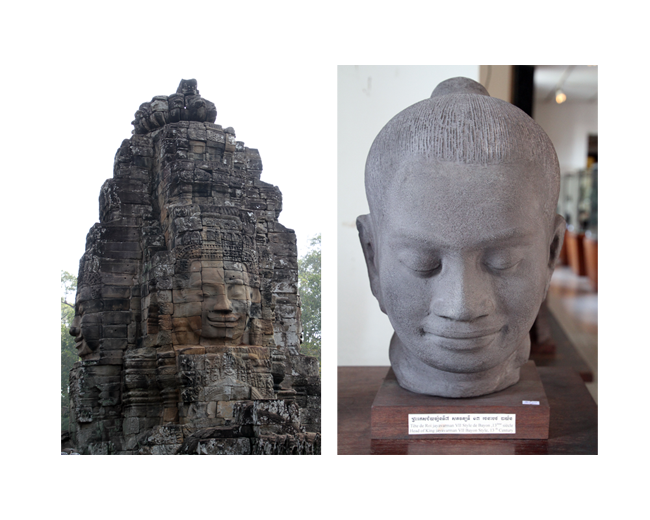 Right Image: Stone sculpture of Jayavarman VII, at the Cambodia National Museum at Phnom Penh. 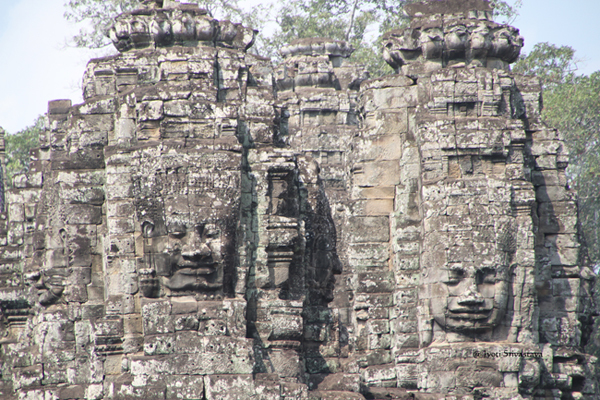 The similarity of statues of Jayavarman VII and the Bayon face-towers has led some to believe that it is the King himself whose face is depicted on the towers. Others have said that the faces belong to the bodhisattva of compassion called Avalokitesvara or Lokesvara. 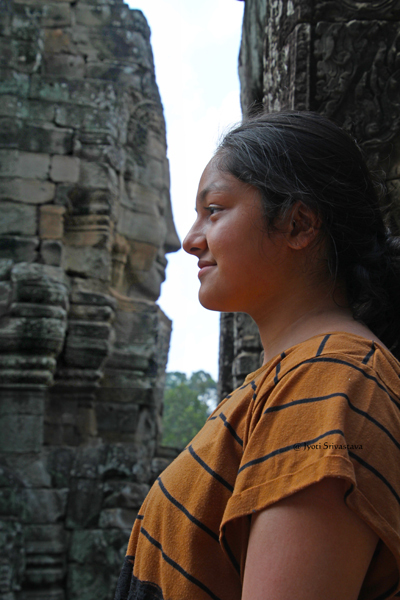 My niece Rhea with the face towers of Bayon / Siem Reap, Cambodia. Bayon / Siem Reap, Cambodia. At the time of the temple’s foundation, the principal religious image was a statue of the Buddha, located in the sanctuary at the heart of the central tower. The statue depicted the Buddha seated in meditation, shielded from the elements by the flared hood of the serpent king Mucalinda. During the reign of Hindu monarch Jayavarman VIII, the figure was removed from the sanctuary and smashed to pieces. 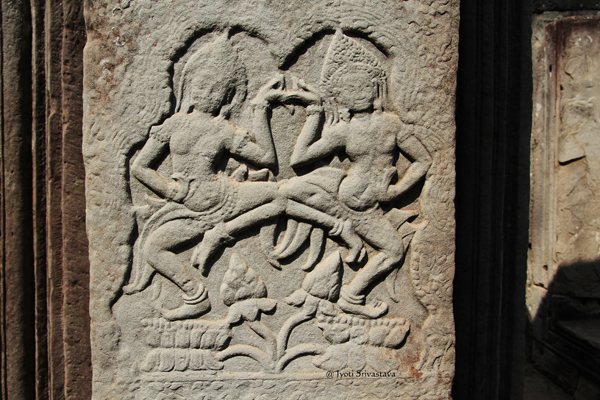 After being recovered in 1933 from the bottom of a well, it was pieced back together, and is now on display in a small pavilion at a Buddhist terrace named Vihear Prampil Loveng, along the way from the Royal Palace East to the Victory gate. Bayon has some Buddha statues like the image above. 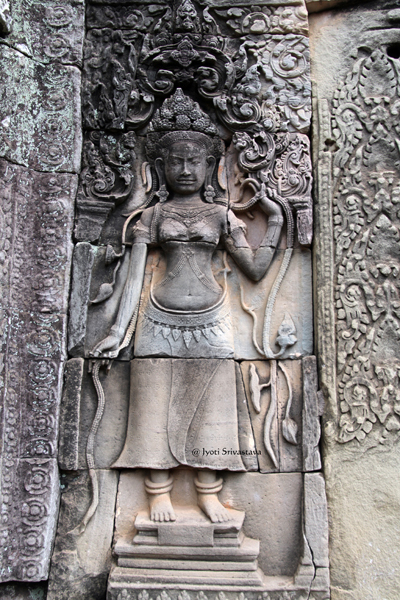 Bas Reliefs at Bayon / Siem Reap, Cambodia. Other than the famous face towers, Bayon temple is also known also for two impressive sets of bas-reliefs, which present an unusual combination of mythological, historical, and mundane scenes. 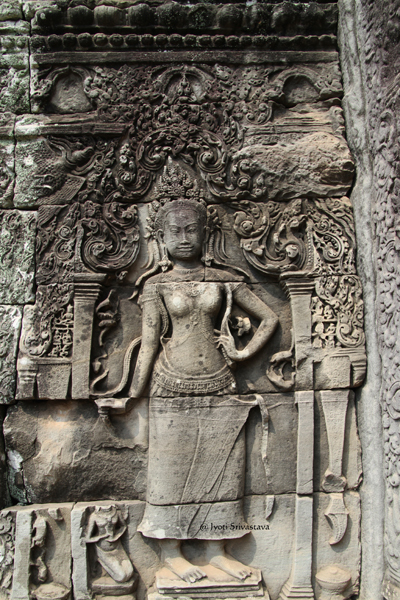 Apsara bas relief of Bayon / Siem Reap, Cambodia. 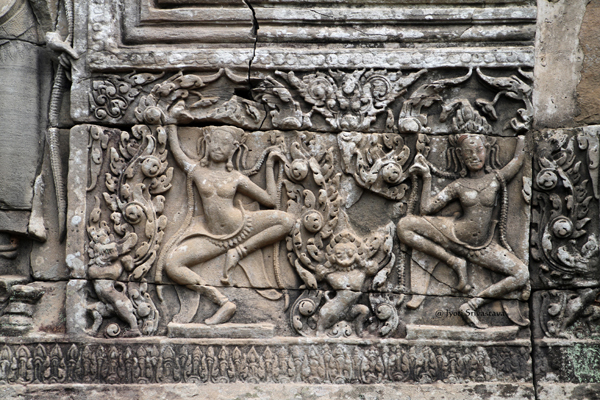 NOTE: there were many mythological, historical, and mundane scenes in bas relief in Bayon, but I was concentrating mostly on the Apsaras, throughout my Angkor tour. For a change here is God Indra on his three headed elephant Airavata. 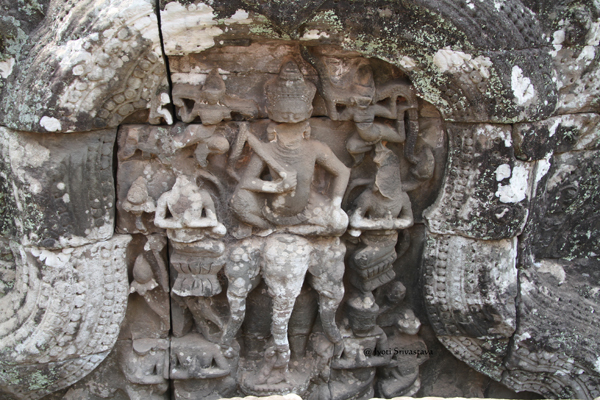 God Indra on his three headed elephant Airavata – Bayon / Siem Reap, Cambodia. 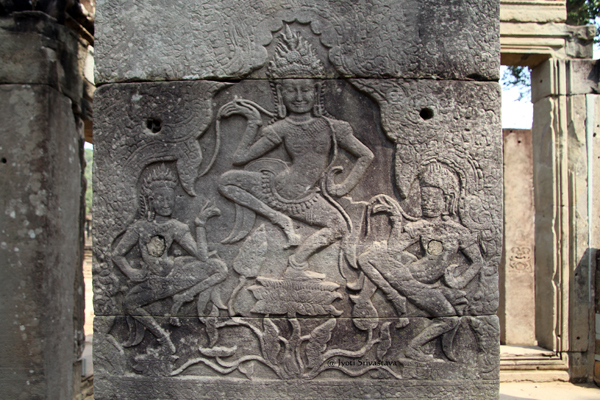 Angkor Thom was built was Jayavarman VII (1181 – 1215). He is the greatest of all Khmer rulers. He waged war against Champa and conquered much of their land. 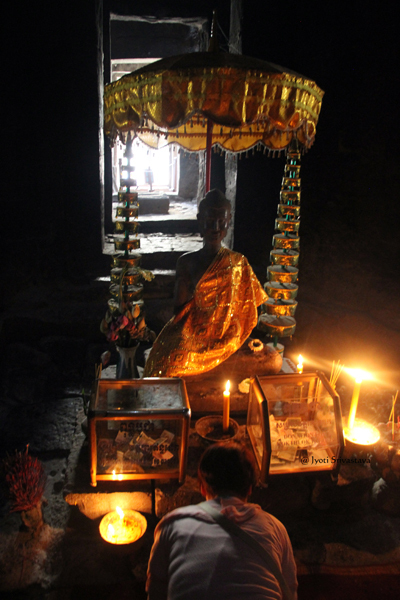 Jayavarman VII was a follower of Mahayana Buddhism and made this Khmer’s new religion. Jayavarman VII made the walled city of Angkor Thom, with Bayon as it’s capital. Bayon is in the exact center of Angkor Thom. All the four Gates of Angkor Thom lead to Bayon. 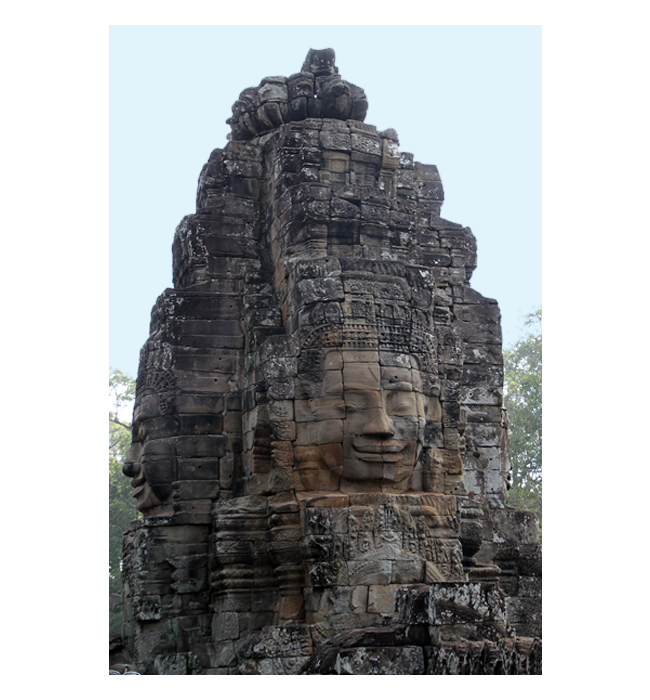 Several monuments are located within the walled city of Angkor Thom.. In the centre of the Angkor Thom stands one of Jayavarman VII’s greatest achievements, the temple now called Bayon. 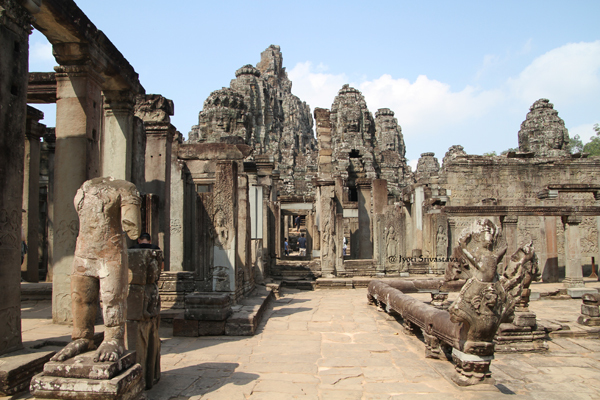 Bayon is a multi-faceted, multi-towered temple that mixes Buddhist and Hindu iconography. Other monuments in Angkor Thom are listed above. 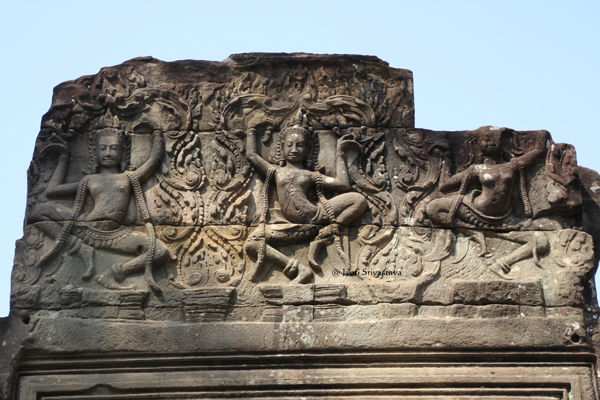 Preah Khan – dedicated to Jayavarman’s father.